Why the home-improvement giant is poised to deliver a double-digit raise to income investors next year. Home Depot (NYSE:HD) shareholders have enjoyed the best of both worlds lately. Not only has their stock trounced the broader market over the last three years, but dividend growth has been impressive as well. The payout spiked higher by 26% last year and rose 17% for fiscal 2016. Looking ahead, Home Depot investors have every reason to expect a similarly generous 2017 dividend boost when the company posts its fourth-quarter results early next year. What's going right with Home Depot? For starters, the home-improvement giant is growing at a much faster pace than rivals. Comparable-store sales spiked by 6% last quarter, double Lowe's (NYSE:LOW) 3% figure. Home Depot executives recently affirmed an aggressive outlook that predicts 5% overall comps in 2016 even as Lowe's is forecasting gains of less than 4%. A steadily improving housing market is giving Home Depot confidence that its growth streak will last at least into 2018. At the same time, CEO Craig Menear and his team feel good about how they match up against competitors. "Our outlook for the remainder of the year reflects modest GDP growth, continued benefit from the housing market and, candidly, some market share gains," management told investors at the last quarterly check-in. With both the short- and medium-term outlooks seeming strong, executives have no reason to hesitate boosting their capital return spending next year. If anything, Home Depot is running ahead of its long-term plan to boost profitability. Operating margin just hit 14.5% of sales over the last nine months, which is the annual target that management set for itself as a 2018 goal. The comparable figure was 13.3% the previous year, and this is another area where the market share leader shines over its smaller rival. 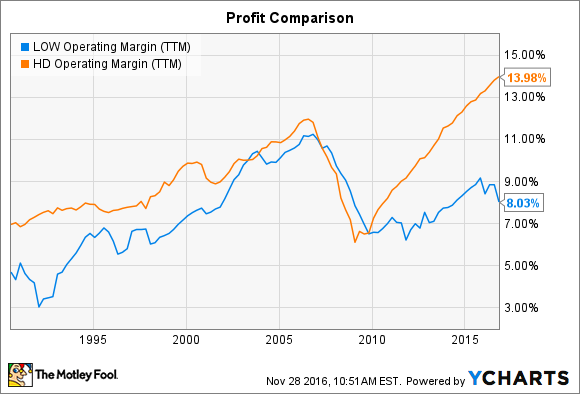 Lowe's margin has been stuck in the single digits since the housing market crisis while Home Depot's has fully recovered to set new all-time highs. Both companies tie their dividend payments directly to earnings but at far different rates. Lowe's has a stingier target of delivering 35% of earnings back to shareholders through dividends, compared to Home Depot's 50% goal. The more substantial payout rate played a role in the company having to pause dividend hikes during the housing market crash. Yet it also means income investors can expect bigger raises during growth periods like this. Surging profits help dividend growth in another important way by giving Home Depot the ammunition it needs to slice the company's outstanding share count. Management has poured resources into that goal over the last few years, spending $22.5 billion just since 2013 on buying back stock. The effect is powerful over even small time periods. Last quarter, for example, net earnings rose by 14% but -- thanks to a 4% drop in the share count -- per-share earnings jumped by 19%. Home Depot just hiked its 2016 stock repurchase spending goal by $2 billion to $7 billion, which promises to keep its share count slump continuing into next year. That means investors can count on a larger percentage of earnings accruing to them. It also makes dividend hikes relatively cheaper for management to approve, since they're paid on a per-share basis and the number of those shares is trending sharply lower. 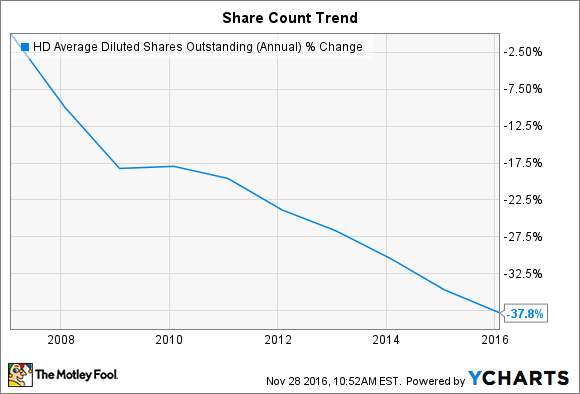 HD average diluted shares outstanding. Data by YCharts. Home Depot's latest forecast calls for earnings to stop at $6.33 per share for the full 2016 fiscal year. At a 50% payout rate, that would imply an annual dividend of $3.17 per share next year, compared to $2.76 per share in 2016. That implied 15% raise would be even better news for long-term shareholders, who will have seen their quarterly dividends double in just the five years since 2013 if Home Depot raises its annual dividend to $3.17.